A birthday wish for Jackie Shroff from Anil Kapoor. Our favourite star Jackie Shroff is celebrating his 61st birthday today. And guess who elated the actor with his heartwarming wish? He's none other than Lakhan - Anil Kapoor. Yes, Anil Kapoor, Jackie Shroff's Ram Lakhan co-star and his good friend, posted a sweet birthday wish for him. Nothing could have been better for Jackie Shroff than to receive such a jhakaas message from Anil Kapoor. "A friendship that has seen every up and down and witnessed a lot of firsts! That's the bond him and I share till date! Happy Birthday, Ram!!! @bindasbhidu have a fantastic year! Lots of love - from your Lakhan," wrote Anil Kapoor. 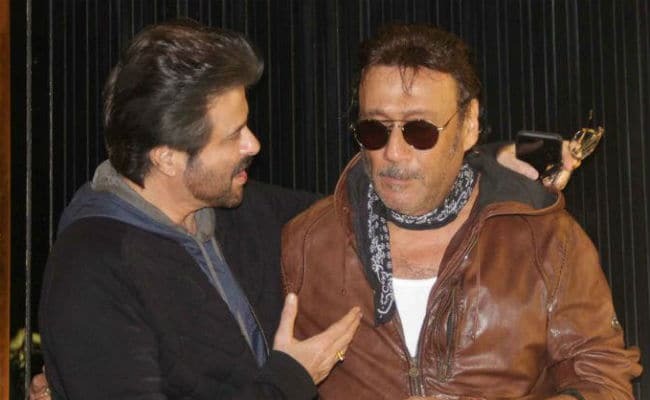 Jackie Shroff, who played Anil Kapoor's elder brother Ram in 1989 release Ram Lakhan, thanked him for his wishes and even promised a meal to him. He replied, "Lakhan my affection always. Get you a meal when both free." Anil Kapoor and Jackie Shroff have worked together and featured as brothers in many films. Such films include names like Karma, Roop Ki Rani Choron Ka Raja, Parinda, Kabhi Na Kabhi among others. Other stars also poured in their birthday wishes for Jackie Shroff. His wife Ayesha Shroff posted a photo of Jackie Shroff cutting his birthday cake and wrote: "Happy birthday to the biggest heart I know." Tiger Shroff, who will soon star in Baaghi 2 and Student Of The Year 2 posted a photo of father Jackie Shroff and wrote how blessed he feels to be his son. "Happy birthday to the most handsome hero onscreen and offscreen in the world! @apnabhidu #bestdad #blessedtobehisson," read the caption of the photo. This is what Jackie Shroff replied. Abhishek Bachchan, who has shared the screen space with Jackie Shroff in Housefull 3 also tweeted for the actor. "To the coolest dude in town...@bindasbhidu happy birthday Duds. Stay cool." To the coolest dude in town...@bindasbhidu happy birthday Duds. Stay cool! Jackie Shroff, star of films such as 1942: A Love Story, Khalnayak, Rangeela and Tridev, is reportedly filming Saaho and Paltan while Anil Kapoor is currently shooting Fanne Khan with Aishwarya Rai Bachchan and Total Dhamaal with Madhuri Dixit, Ajay Devgn and Aamir Khan.